Take all ingredients and put into food processor. Add 1/4 cup water, blending until smooth dressing consistency develops. Sprinkle with sea salt and pepper to taste. 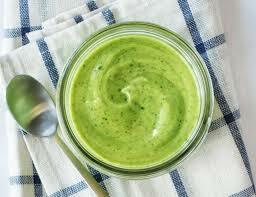 This is a wonderful spring dressing, loaded with healthy fats and great nutrition. We love using this dressing for salad, as a dip, on a sandwich, pouring it over sides – like veggies, quinoa and more. Also makes a wonderful topping to protein whether it is grilled tofu, chicken or other. This dressing has a fresh and crisp flavor. It’s delicious on a kale salad and so many others. Previous Post Seasonal Berries & Salad Yum! Next Post Wishing you all a Wonderful Day & Week – Make it GREAT!